THESE PEPPERS SHIP MONDAY DECEMBER 31st 2018!! PLEASE ADVISE!! We decided to put together a "Mixed Box" of fresh peppers! 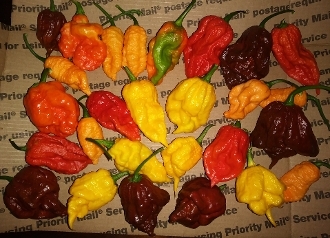 Each box ordered will have a totally random MIX of some of the Fresh Peppers we grow and sell. We DO NOT LABEL INDIVIDUAL PEPPERS IN THIS BOX...This is your chance to sample some of the different types of peppers we grow, and your chance to experience the different heat levels and flavors! Its pretty INTENSE if you ask me! :) There will be no rhyme or reason as to which types or how much of each type will be in each box, but we do GUARANTEE they will ALL be NUCLEAR HOT since thats all we grow! The "POSSIBLE" types included are as follows. This list is based on whats CURRENTLY ripening on our plants. This lists changes as the season moves forward...please advise! *Purchase/Consume at your OWN RISK!! !